When you’re visiting Reno Tahoe, sailing Lake Tahoe is the best way to experience the lake’s pristine water. 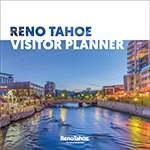 This is a great way to experience the views of the the Sierra Nevada mountains and some of the best beaches at Lake Tahoe. Several of our local sail rental sports offer lessons for beginners and guided tours.